Although trade between the East and West goes back thousands of years to the treacherous land crossing called the Silk Road, by the 16th century countries were establishing less dangerous and more profitable sea routes for important trade between Asia and Europe. In China during the reign of the Kangxi emperor, 1661 to 1722, there was a great expansion in trade between the East and West. In the 16th century, European mariner adventurers and traders explored the world in search of wealth and new shipping routes; in the 17th century these sea trade routes were firmly established. The Dutch, British, and Portuguese vied with each other to cement trade relationships by sending ambassadors, emissaries, and expensive gifts from the royal courts of Europe to the Imperial courts of China. The Portuguese dominated this trade in the 16th century, the Dutch in the early to mid-17th century, and the English arrived at the end of the 17th century. Tea, silk, and porcelain were traded for wool, tin, lead, and silver. Slowly various goods from the East became available to the wealthy elite of Europe. These goods were rare and considered luxury items. 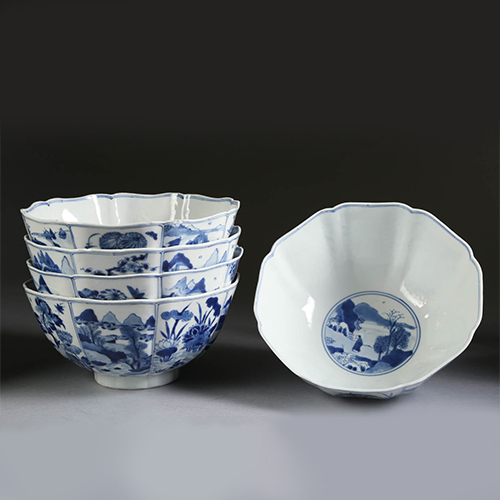 During this time porcelain was produced only in China. The secret ingredient, kaolin, and the process of high firing, was unknown to the rest of the world. Porcelain was prized for its strength, translucence, and its pure white color. Porcelain was so associated with its origin, that this expensive and important ceramic came to be known simply as “china,” “fine china,” or “china ware." 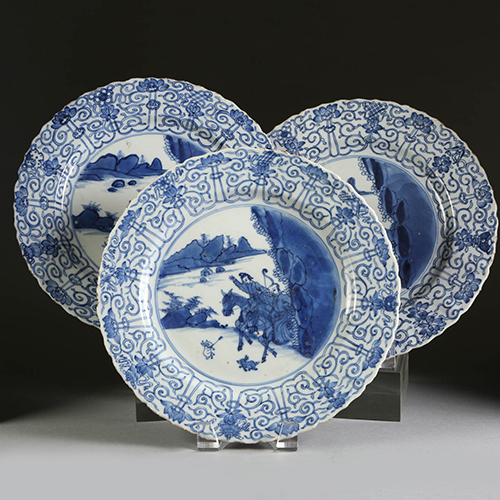 In the 17th century, China began to create porcelain specifically intended for sale on the European market. Some of the earliest pieces of this “export” porcelain, Kraakware, dates to the late Ming dynasty, just before the Kangxi period. 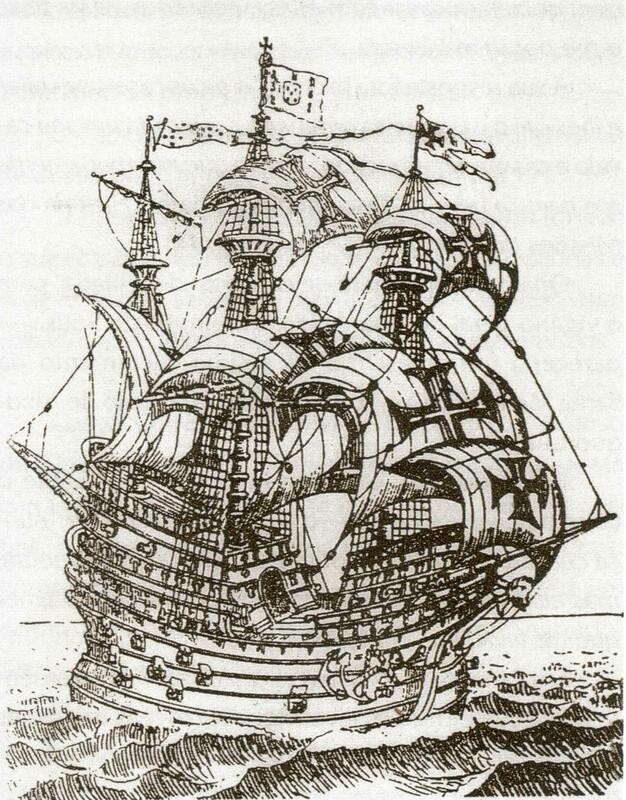 The name “Kraakware" is believed to have come from Portuguese merchant ships called “carracks," a type of masted sailing ship. Kraakware is always decorated in underglaze blue and often characterized by a central image of flowers, birds, or animals, surrounded by panels with Chinese or other symbols. Porcelains decorated with different colored enamels became available in the mid-17th century, which coincided with the use of European motifs and subject matter on Chinese-produced goods that were intended for sale in the West. Around 1740 Europeans began to send engravings to China for custom-decorated services. These often very large sets of tablewares bore beautiful hand-painted monograms, armorial crests, or more elaborate allegorical subject matter and even religious scenes such as the nativity. The market for these Eastern items created a fad in Europe for Chinese taste and decoration, called “Chinoiserie." The majority of pieces had a flower pattern that may have incorporated a beautiful landscape or figures in a pastoral scene. This fad and these motifs were so lasting, that even though they are no longer the height of fashion, they are still produced and used today. These small articles, originally made for everyday use by the aristocracy and rich burghers, have risen to being regarded as works of art in their own right. They tie us in the 21st century to the superlative handmade craftmanship of the past, and the incredible sea-roads these pieces travelled to be collected and revered for so long.